If you found this web page while searching for a specific Person then you are almost certainly dealing with an scammer. You better stop all communication immediately since this person is dangerous and will probably try to get you bankrupt within shortest time, if not even worse. By the way, the smarter the scammer, the longer he will wait before he begs you for money or something else. Online Scammers like to “steal” and use the identities of real persons or companies, or abuse their email addresses as their own sender-addresses, in order to appear more legitimate towards their victims and gain their trust. I do not have any influence on that. 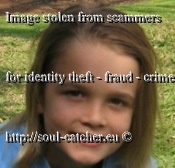 Please understand that the rightful owners of abused names or email addresses mentioned in my blog, are not connected with any unlawful activities of criminal email scammers. If you can, block the SCAMMER. You will live much safer with that. If you need further help, get in touch.